Recently I posted about my experiences in shooting and postprocessing images of some historic buildings in Rhode Island, choosing images of two different sites for examples. One building, the Bradford Soap Factory, is still in use for its original purpose; the other, the Royal Mills, has been converted from its previous industrial use to a block of residential apartments. What they have in common, however, is that both are in essentially urban settings and are still in use. This enabled me to be quite consistent in my postprocessing; in each case it was the same preset in Topaz Adjust 5 and Nik Silver Efex Pro 2 that I could use with effect for color and monochrome versions respectively. That changed when I went to process two other sets of images. One was from the same Rhode Island shoot — the “decrepit” (to use the Providence Journal‘s word) Hope Mill in Scituate — and the other from one of my frequent and recent trips to the Northern Catskills, home of many hotels and resorts that went bust — this time a resort called Villa Maria that occupies an extensive property in Haines Falls. These two sites also have two things in common: they’re not in urban settings and they’ve not been kept up. This means an awful lot of overgrowth with grass, greenery, and, in the case of the Haines Falls site, plenty of goldenrod. So, when I tried to process the Hope Mill images, I quickly realized that the same Topaz Adjust preset wasn’t going to work for the color: the greenery — and there was plenty of it — was undersaturated and the results were rather lifeless. I used different presets (again in Topaz Adjust) that worked for the Hope Mill images, and for the monochrome could continue with the same preset in Nik Silver Efex Pro 2. The one at the top of this post was done with Heavy Pop Grunge; the greenery isn’t that overwhelming and the preset brings out the detail in the building nicely. For the image at the left, however, it had to be Heavy Pop Smooth — thus, similar but without the level of detail that would have caused the greenery to overwhelm the building. In both cases, the Heavy Pop brightened up the grass and the sky. Villa Maria was a different story. For one thing, this isn’t one building but a variety of buildings. Also, there was quite a bit more overgrowth. Here’s the problem: I often like to show a lot of detail — structure — in these photographs, on the buildings themselves. But use a high-structure preset where there’s lots of grass and weeds overgrowth and the pictures looks too messy, too busy. What to do? Basically, I separated these images into two types — the ones in which the building prevailed and those in which the overgrowth prevailed — and processed accordingly, again using Topaz Adjust presets (as yet I haven’t processed these in monochrome). Here are some results. Oh, and before I forget: This post could end up being another in my “Do It Now” series: My friend Bill Patenaude sent me an article from the Providence Journal reporting on a Connecticut developer who wants to take over the Hope Mill and give it a similar sort of treatment to the Royal Mills. And I understand (this is anecdotal from someone local in Haines Falls, I have no written source) that someone has bought the Villa Maria site. So, photograph these places while you have the chance … you never know when they’ll change, or even disappear. Close-up of building. minimal greenery, thus a more detailed treatment was possible. In a sense, this image breaks the rules I’ve just established. The grass, weeds, and trees really are the main subject, more than the building, so I let in some detail to highlight this. Villa Maria. Too much detail in all that shrubbery would have overwhelmed the building. I went with a somewhat softer look in which the color prevails. This somehow shows a harmony between the building and the green. 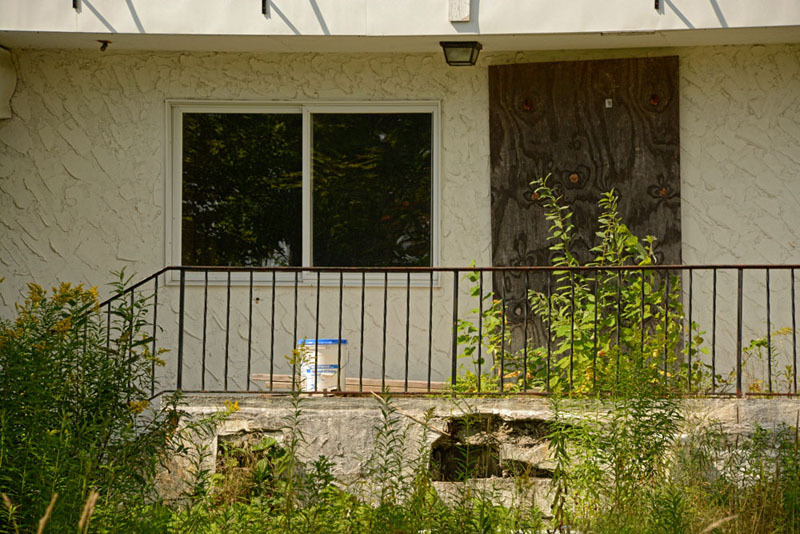 Abandoned buildings get a lot of attention from me and my cameras, and the Cold Spring Resort in Tannersville, NY is one I’ve returned to again and again. 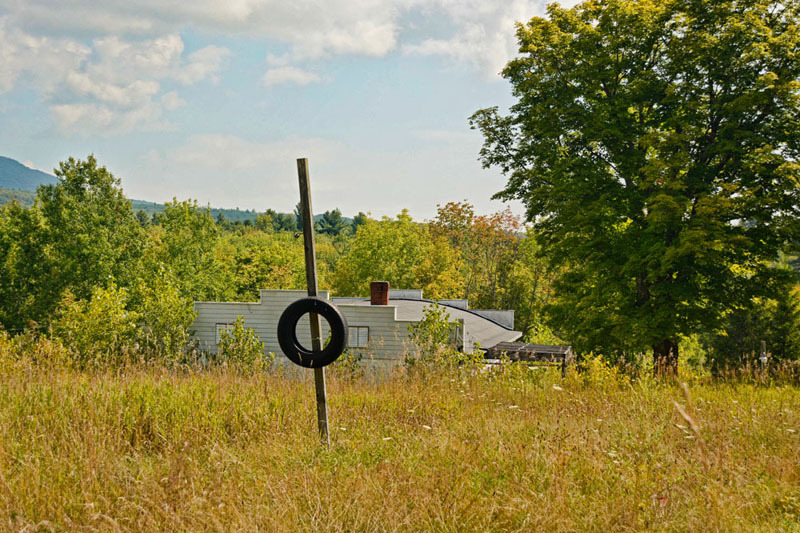 It’s one of the few still remaining from the heyday of the Catskills resort industry. On Saturday I visited for the fourth time—or was it the fifth? In any case, the poor building is in such condition that I never know when a visit will be my last before the place finally gives up the ghost. Speaking of ghosts, if there are any of those occupying the Cold Spring Resort’s many empty rooms, they are friendly ones. The place has a palpable, positive energy about it that I attribute to the countless people who vacationed here back in the day. These are photos from the latest trip. When working on a unified project (which this visit was in aid of) it’s best to process all pictures in a fairly uniform way, but I had to make one exception here with the monochrome image; it was taken with a point and shoot, which produced a color cast that, try as I might, I couldn’t get rid of except by completely desaturating it. (Even without the persistent color cast the image fairly screamed monochrome – there was no color to speak of except for that bit of greenery that, well, isn’t all that green.) I finished it off with Nik Silver Efex Pro. The other images—made with the Nikon D7100—were subjected to rather minimal postprocessing, by which I mean that I did the usual basics in Lightroom and then finished the enhancements in Photoshop – but no plugins, despite my array of Nik and Topaz products. The day was overcast with a sky almost (fortunately only almost) verging on blah washed-out monotone, and in order to help the building and surrounding flora to emerge from the murky grayness I selected the sky, used Brightness/Contrast to darken it and increase the contrast where necessary, then inverted the selection and increased the brightness and the vibrance to make the building pop—not only the building but also whatever greenery, foliage, and flowers were present. 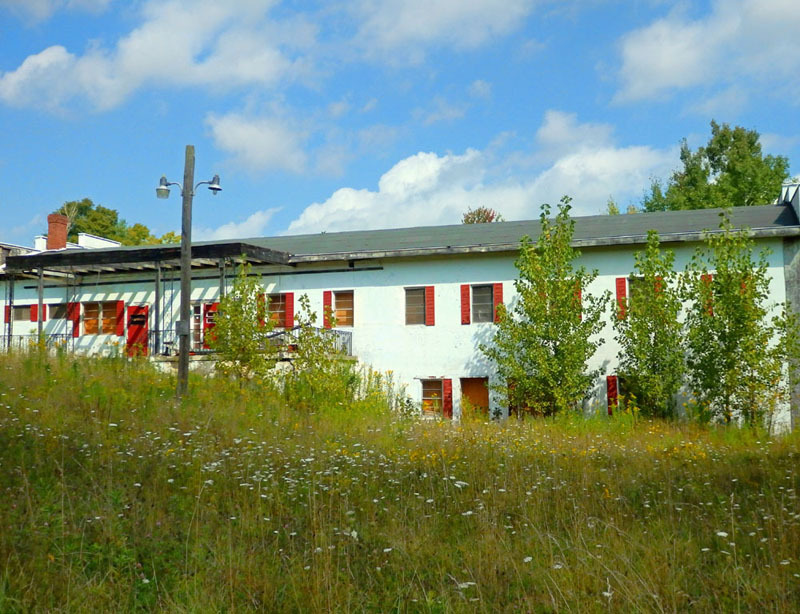 It was important to me to make enough images showing the building (or parts of it) among the vegetation that’s slowly taking it over; a contrast between the dying building and the lively-colored vegetation that, ironically, in its autumn colors represents the dying of the year. At least for some it does; my favorite poet, Gerard Manley Hopkins, wrote that “Nothing is so beautiful as spring,” but then Fr. Hopkins had never experienced the stunning colors of autumn in the Northeastern USA. 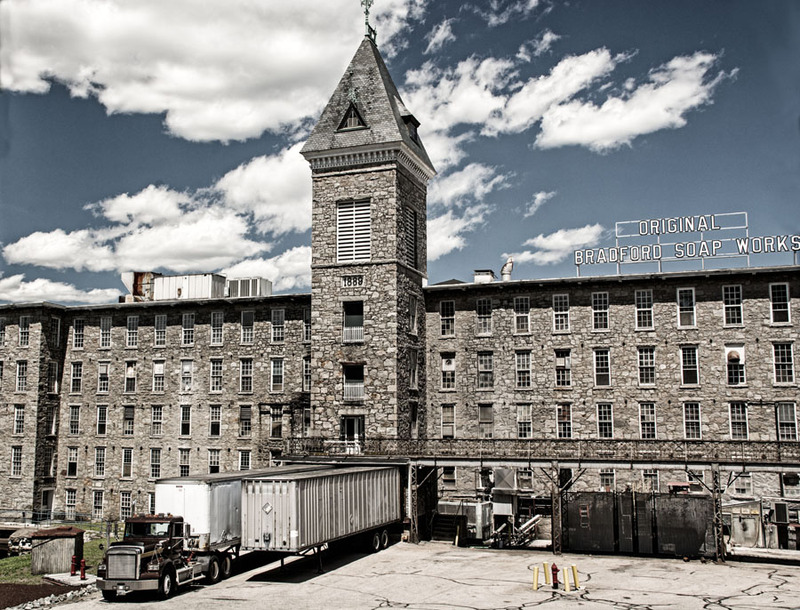 Our first stop was the Original Bradford Soap Works in West Warwick. 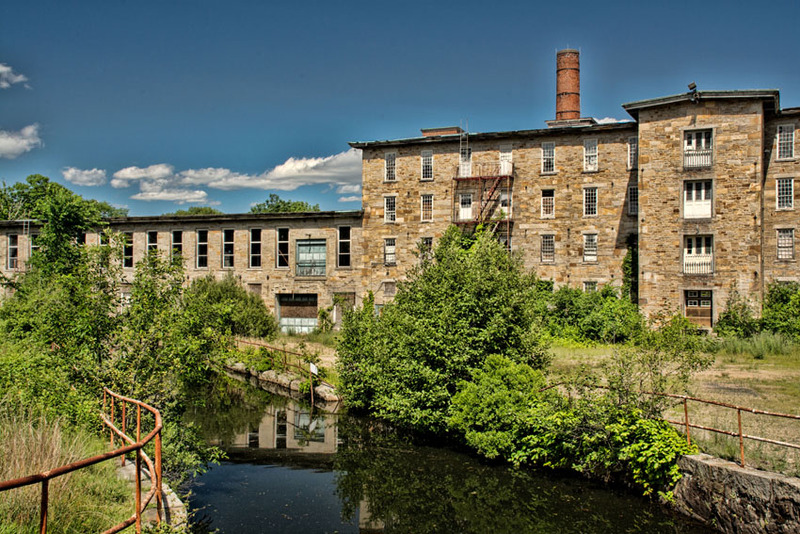 Bradford was founded in 1876 and named after Bradford, England, which was the center of the textile industry there just as Rhode Island was in the New World. The company moved to its present premises in West Warwick in 1931. I’ve processed two of my photos of the Bradford Soap Works, and here I’m showing you the two versions of one of them. 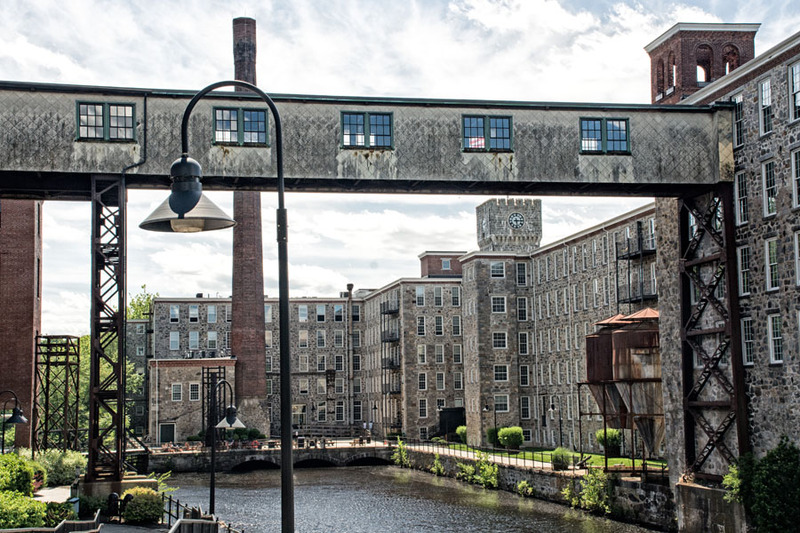 The Royal Mills is the site of a historic textile mill on the banks of the Pawtuxet River. While textile manufacturing here goes back to 1809. the present structure dates from 1921. 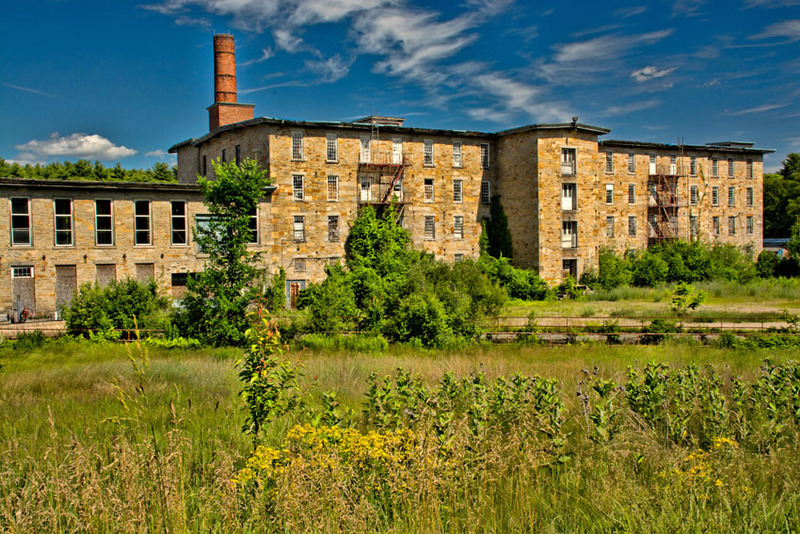 When the textile industry suffered, the site was virtually abandoned until it was taken over in 2004 and converted to an apartment rental complex. In that same year Royal Mills was added to the U.S. National Register of Historic Places. Here is the one photo of the Royal Mills I’ve processed thus far, again in its two versions. Now here’s where I invite you to participate: For each of the two pairs of images, which version do you prefer? (If you prefer a different version for each of the pairs, that’s OK.) Please state your preference(s) in a Comment. And now for the prize: If I get at least five replies, those who commented will be entered in a drawing to receive a 5 x 7 print of one of these images — the image of their choice. I will choose not one but two winners at random. Your replies will help me decide which of the images to offer for sale on my website. You must reply by September 15. I thank you in advance! You are invited to my exhibition — “Natural and Historical Landscapes” — at the Cottage Place Gallery, 113 Cottage Place, Ridgewood, New Jersey. The reception is on Sunday September 14 from 2 to 5 pm. Hope to see you there, if you’re in the neighborhood!